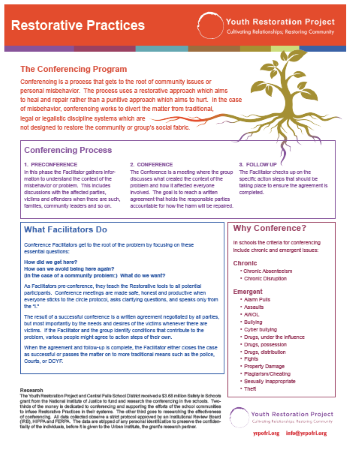 Here are two 1-page handouts describing the skills and tools of Restorative Practices, and a brief explanation of Conferencing for schools and organizations using that technique. Feel free to distribute the ones that suit your purpose. 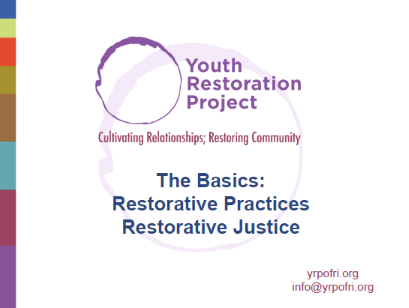 Introduction to Restorative Practices – describing the 3 big-picture concepts of YRP’s model and our 3 basic tools. Family Group Conferencing is a Restorative Justice protocol aimed at preventing recidivism by getting to the root of the problems that result in misbehavior. This is an advanced technique currently being studied by the National Institute of Justice through a grant to implement YRP’s conferencing model in Central Falls and several other RI schools. 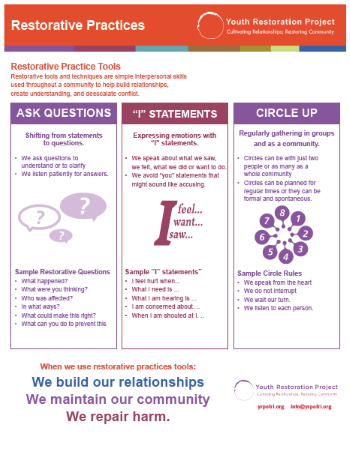 Restorative Practice Tools – this handout elaborates on the use of the tools, with examples. 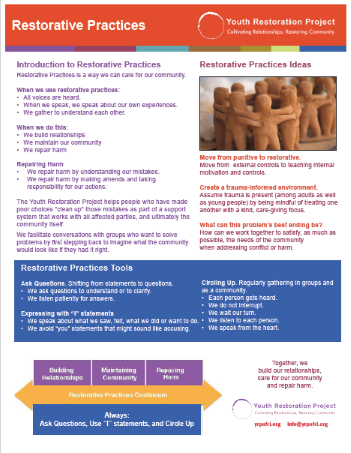 Restorative Practices evolve differently in every community. Shifting the culture of a family, school, organization or community toward a more peaceful and caring interpersonal environment takes time and commitment. The work requires a core group of people – the Implementation Team – to develop strategies, explain and model Restoration, and deal with inevitable obstacles, stumbles, backsliding and grumbling. 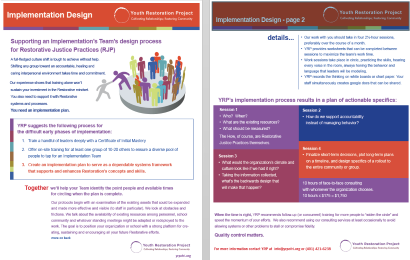 YRP can help you through the tough early phases of implementation, from training the leadership team to strategic planning. We have approaches and materials for getting the word out to your larger community and for monitoring progress toward your goals. A brief outline of the implementation process is available here. Every group – every school, agency, business – is different. So the plan must be tailored to your community’s specific concerns and priorities. Take stock of your organization's interpersonal climate. As good first step, your team needs to ask – what’s working and not working in your culture and climate? What would it look like if everything were great? How is that different from where you are now? What’s in place that could be built out more restoratively? And how will you know when your project to introduce Restorative Practices is succeeding? Metrics matter. Do you already have data you can use to measure progress – on absenteeism, formal complaints, turn-over, etc? 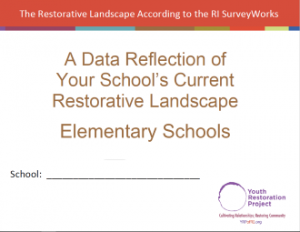 RI Schools – Fill out a Restorative Landscape Data Worksheet. Rhode Island schools are lucky to have a wealth of climate data available. The RI Department of Education administers an annual survey to students, teachers, staff and families at all RI public schools, called SurveyWorks. With advice from experts, YRP culled the questions that relate most directly to school culture and climate in these data worksheets, available for both Elementary and Secondary schools. These offer a statistical view of your community’s health, letting you compare the 2017 and 2018 survey results for your school – available on-line at SurveyWorks – with State averages. These results give valuable information meant to prompt discussion about your school’s current climate and how it can be improved. It’s likely that different groups in your community may see the data differently, which can lead to creative solutions. Remember, these survey responses came from your community as a whole. Train your core leadership group to ensure the work takes root. A nucleus of people in your organization will need in-depth knowledge of the background and philosophy of Restorative Practices. They’ll also need some experience using these skills, to build confidence as they work on strategic planning, spreading the word and handling questions. Our training process shows participants how to support one another as they master the tools and learn to act as leaders of the implementation process. We’ve found that even at a large public school, it’s possible for a group as small as five to sustain the project’s momentum over time, while helping the community gradually shift its mindset. You can download our current training schedule here. Identify who will be responsible for the initiative on a day-by-day basis. Your Implementation Team should include a high-level administrator with authority to make decisions. You’ll also need someone to serve as liaison with your trainers and consultants. In a large project you may also need a point-person to oversee the progress of action items set by the team. The most demanding work needs to be spread among several people. They’ll be responsible for coaching less-skilled staff in handling conflicts and responding restoratively to incidents of misbehavior. The goal is to build up a sense of collective responsibility for the community’s health. The Restorative mind-set can dissipate all too easily unless specific individuals are assigned to keep the momentum going every day. As the work gets going, communicate with your school community. Every member of your community needs to have at least a basic understanding of Restorative principles and why they’re vital to improving interpersonal connections in any community. We recommend that everyone be introduced to these ideas through a simple presentation of basic tools and concepts, like the sample offered here. We tailor our presentations to each specific school or organization, after some initial discussion with their leaders about needs and priorities. We’re also available to talk with groups that are just curious about what RJP is and what it can accomplish. Our favorite way of getting people involved is to give them a “taste test,” with a few competitive games to make the basic tools training fun for novice participants. 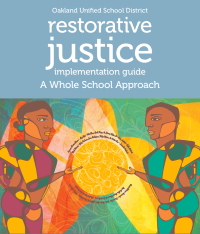 Look for our Annual Spring Symposium on Restorative Justice Practices in Rhode Island, which takes a different approach each year to this huge subject. Scroll down to join our mailing list, to make sure you’ll be notified. Consider getting outside help from a Restorative Practices consulting group. Consulting with people who’ve been through the process in many different schools and environments can help prevent your efforts from losing momentum as enthusiasm dissipates. Once real improvements have taken hold, communities can feel like they’re “done,” and no longer need to push to change their cultural norms. But when trouble arises, it’s all too easy to slip back into handling conflict and misconduct in ways that undermine the sense of community. Outside consultants can provide fresh eyes on your situation, help you develop measurements for your project’s success, and ensure that it stays on track over time. Nourishing a new kind of community culture takes vigilant observation, debriefing and support. You can download a summary of YRP’s services here. 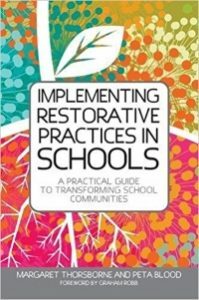 Two on-line implementation guides from the school systems of Oakland and Denver, plus a book by a pioneer in developing the Restorative approach in Australian schools. YRP’s materials were developed with the assistance of a Schools in Safety grant from the National Institute of Justice.